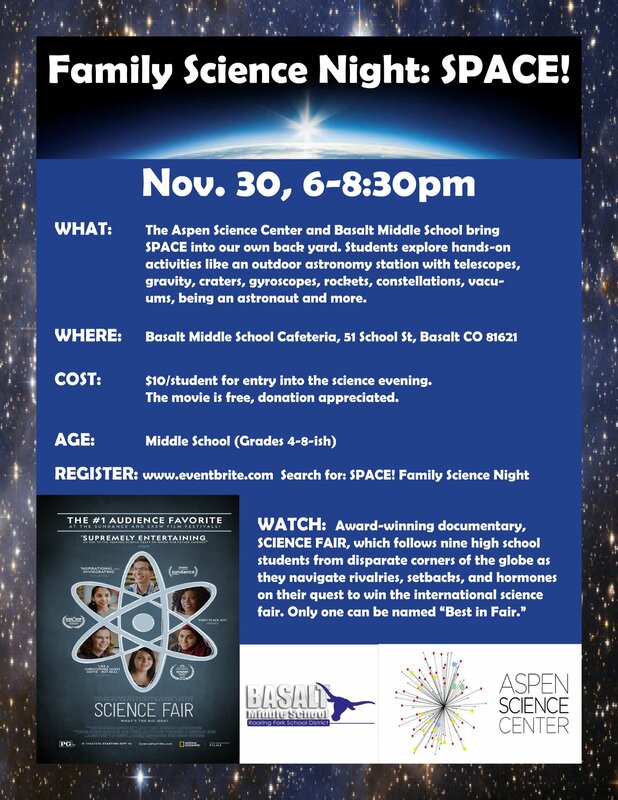 In conjunction with the Aspen Science Center, Basalt Middle School is celebrating its 6th annual Family Science Night on Nov. 30th from 6-8:30pm. This event is open to any middle school-age student (grades 4-8 ideally) in the region and the theme is Space. Hands-on activities will include an astronomy station with telescopes and stations on gravity, planetary craters, life as an astronaut, rocketry, the solar system, constellations, and more. BONUS! This year we’re also showing the award-winning documentary SCIENCE FAIR for free! Registration is required online. The cost is $10/student.